The Minnesota Public Relations Blog is proud to announce three new interns just in time for its 9th Anniversary. Reaching out to his alma mater University of Minnesota graduate, Ryan May has chosen to hire three students from the University Scott Berman, Abbey Seashore and Emily Homuth. All three students are currently enrolled in the University of Minnesota School of Journalism and Mass Communications (SJMC). Berman is a senior is studying strategic communications and business and brings two years of marketing and sales experience gained working as a freelance marketing consultant for several local organizations. 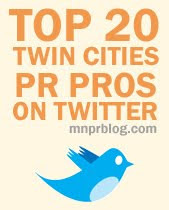 He has also done marketing communications internships at ShopNBC, KXXR Radio (93X), and Edina City Hall. Born and raised in N.Y., Scott is a passionate guitarist and avid traveler, having visited nearly 20 countries on five continents.If you’d like, contact Scott at scottberman.pr@gmail.com. You can also connect with him on LinkedIn or Twitter. Seashore is majoring in advertising, minoring in management, and has had previous experience with sales for four years now. You can contact Abbey at seas0018@umn.edu or connect with Seashore on Twitter and Facebook.